In this video, Yasuhiro and Mitsuyoshi Saito demonstrate Ken Tai Jo which we are working on this week at the dojo. We've been doing the basic endings, but notice in the video he does the advanced endings and extra moves at the end which we will focus more on Thursday and Friday in class. Enjoy the video and we'll see you on the mat! Last Thursday before the long weekend we had an impromptu advanced class. Since we have a few sempai going to re-test into CAA/Aikikai from other styles we worked on the basics of irimi-nage and koshi-nage, then did some tachi-dori (sword taking) and kumi-tachi. 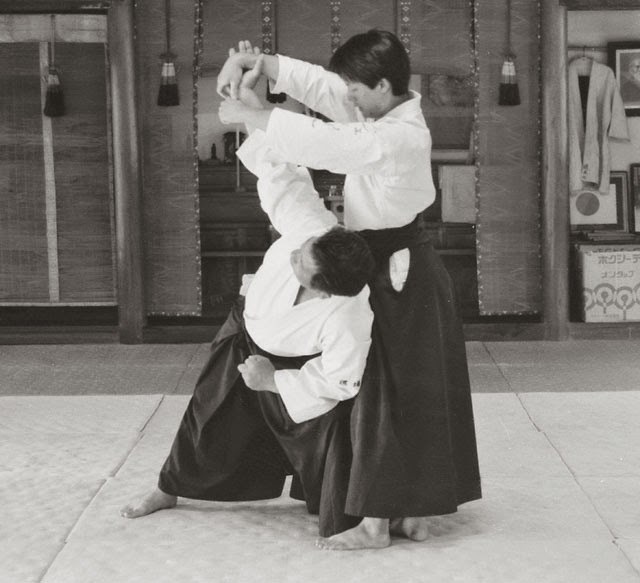 The Aikido of San Leandro sho-dan test requirements (PDF) are a great template for advanced students whether they are getting ready for sho-dan or san-dan. Thanks to the sempai for coming out and training before the holiday weekend! This week (7/7) is kata-dori (shoulder grab) and the 31 kumi-jo. Today is the first Monday so we'll work on weapons and wash the mat after class. Eight months ago when we started Kinjo Dojo in November of 2013, I set a modest goal: Test three new students for 6th kyu. I hoped to have at least three new beginners start from scratch and stay with us long enough to take their 6th kyu test. Last night (2014-6-26), I handed out the third 6th kyu certificate to one of our new beginners. Congratulations to Jared, Kim, and Nathan on their accomplishment; thank you for coming out and supporting the dojo! And of course congratulations goes to my son Evan for his 6th and 5th kyu promotions since we started the dojo. I didn't count him as one of the 3 because he's been training with us since we were down south with Blevins-sensei and Kiryu Aikido. Also he's family and often gets dragged into class whether he feels like it or not! We still have 4 more months to go before our first year anniversary. I hope to see a few more interested students walk through the door to begin their path in aikido. We are beginning our workshop series this week with shodan review. This training is open to anyone 3rd kyu and above and will focus on requirements for the Aikido of San Leandro sho-dan test. This workshop is only open to students 3rd kyu and above because we have a very limited amount of time to cover a large amount of material! Even with 3rd kyu and up it will be a challenge to get through everything and still have time to do practice tests at the end. Anyone is welcome to drop by at any time during the training and observe. Please do so! It's a great time to see advanced practice and get a better idea of what's to come in your training. These workshops are meant to help students prepare for their next rank, or provide an opportunity for some extra training and ukemi (falling) practice. Each workshop will cost $20 for the day. I'm hoping to have these every month at least, and typically on Saturday. The next workshop will focus on 4th kyu and will be open to everyone. The 4th kyu test includes techniques from both 6th and 5th kyu, so students working on those tests will benefit as well. Hope to see everyone at the upcoming workshops, gambatte (do your best)! 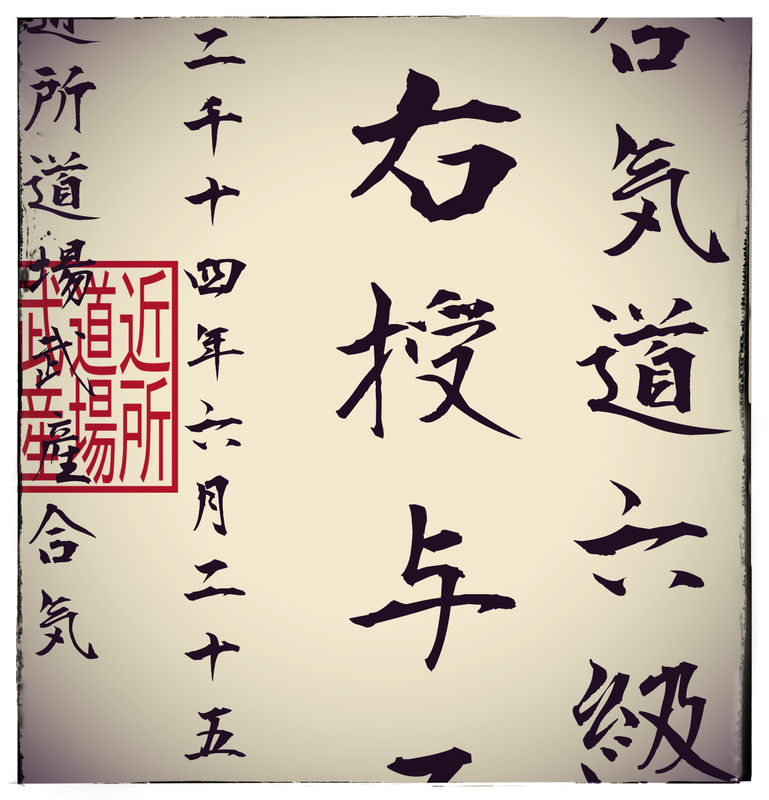 On June 22nd we will have a workshop for students seeking sho-dan. Throughout the day we will focus on the sho-dan test requirements from Aikido of San Leandro and Pat Hendricks Sensei. Since ASL is affiliated with the CAA and Aikikai, this includes the requirements from the Hombu/Aikikai test so all styles are welcome. This training is for anyone 3rd kyu or higher. Cost is $20. Focus on the test requirements and clean up your techniques. Slow down and work on your form; it's not a race! If you are coming from other styles and re-testing into CAA Division 1, you can focus on Iwama weapons and changes to the open-hand techniques. Everyone else can enjoy the extra training and review. This is our first all-day event as a dojo and I'm looking forward to working with Kinjo Dojo students and preparing them for what's ahead. Other styles and dojos are welcome to attend and I hope to see some visitors on the mat and in the park for weapons practice! Location (morning weapons): Memorial Park in Arvada (map). We'll meet at the southwest area of the park. There is a small shelter and shade trees. Update (2014-6-10): There is a big bike race going on the day of our training so we will probably move morning weapons to another park. Check here or one of the event links below for updates. We're adding to the schedule! Monday night classes will start next week and go from 7:30 to 8:30. That will give us a total of 5 and a half hours of training time each week.